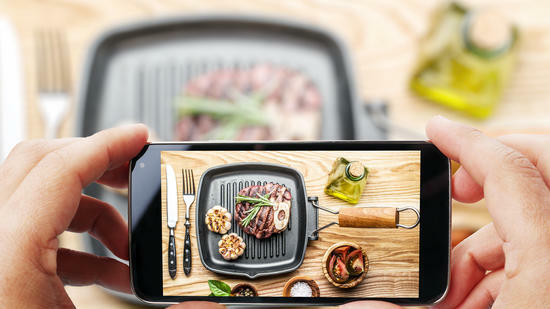 Researchers trained an artificial intelligence system to look at a photo of food, predict the ingredients and suggest similar recipes. Researchers develop(ed) a database of over 1 million recipes annotated about the ingredients in a range of dishes. They used that data to train a neural network to find patterns between the food images and the corresponding ingredients and recipes. The system did well with desserts like cookies or muffins. It had difficulty determining ingredients for more ambiguous foods, like sushi rolls and smoothies. Researchers from MIT’s Computer Science and Artificial Intelligence Laboratory (CSAIL) believe that analyzing photos like these could help us learn recipes and better understand people's eating habits. In a new paper with the Qatar Computing Research Institute (QCRI), the team trained an artificial intelligence system called Pic2Recipe to look at a photo of food and be able to predict the ingredients and suggest similar recipes. CSAIL graduate student Nick Hynes was lead author alongside Amaia Salvador of the Polytechnic University of Catalonia in Spain. Co-authors include CSAIL postdoc Javier Marin, as well as scientist Ferda Ofli and research director Ingmar Weber of QCRI. The web has spurred a huge growth of research in the area of classifying food data, but the majority of it has used much smaller datasets, which often leads to major gaps in labeling foods. In 2014 Swiss researchers created the “Food-101” dataset and used it to develop an algorithm that could recognize images of food with 50 percent accuracy. Future iterations only improved accuracy to about 80 percent, suggesting that the size of the dataset may be a limiting factor. Even the larger datasets have often been somewhat limited in how well they generalize across populations. A database from the City University in Hong Kong has over 110,000 images and 65,000 recipes, each with ingredient lists and instructions, but only contains Chinese cuisine. The CSAIL team’s project aims to build off of this work but dramatically expand in scope. Researchers combed websites like All Recipes and Food.com to develop “Recipe1M,” a database of over 1 million recipes that were annotated with information about the ingredients in a wide range of dishes. They then used that data to train a neural network to find patterns and make connections between the food images and the corresponding ingredients and recipes. The system did particularly well with desserts like cookies or muffins, since that was a main theme in the database. However, it had difficulty determining ingredients for more ambiguous foods, like sushi rolls and smoothies. It was also often stumped when there were similar recipes for the same dishes. For example, there are dozens of ways to make lasagna, so the team needed to make sure that system wouldn’t “penalize” recipes that are similar when trying to separate those that are different. (One way to solve this was by seeing if the ingredients in each are generally similar before comparing the recipes themselves). In the future, the team hopes to be able to improve the system so that it can understand food in even more detail. This could mean being able to infer how a food is prepared (i.e. stewed versus diced) or distinguish different variations of foods, like mushrooms or onions. The researchers are also interested in potentially developing the system into a “dinner aide” that could figure out what to cook given a dietary preference and a list of items in the fridge. The project was funded, in part, by QCRI, as well as the European Regional Development Fund (ERDF) and the Spanish Ministry of Economy, Industry, and Competitiveness.